(UnhappyFranchisee.Com) We are inviting all those involved with the conception, planning, marketing, promotion, selling, and implementation of the Clubstore Outlet franchise launch to help us piece together exactly what happened and why. We especially want to know: where did all the money go, and to whom? Clubstore Outlet is by no means the largest or most devastating predatory franchise scheme we’ve covered here on Unhappy Franchisee, but it is worthy of a thorough analysis, autopsy, and an “outing” of the players. Because of the meteoric launch and rapid collapse of the Clubstore Outlet dream and scheme – which happened over the course of only about 2.5 years – and because of its limited size, players and factors, it can potentially provide a succinct case study and a revealing look into how and why a segment of the franchise industry focuses on launching and selling “hot new franchises” by companies without the capital, experience, wherewithal and sometimes even the intention of remaining in business even medium-term. Who makes money gaining the trust of mom & pop franchise investors, convincing them to go all-in on an unproven, untested scheme with no track record? How much lucre do they extract from the house of cards before it collapses? And why are they not at risk of civil or even criminal repercussions? What follows is an index of sorts of our investigative posts on Clubstore Outlet… very much a work in progress. 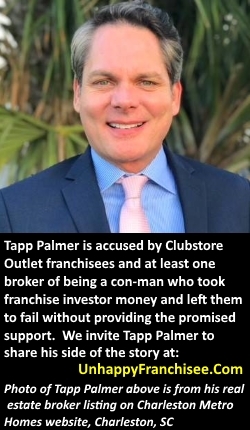 Are you familiar with Tapp Palmer, the Franserve brokers and the Clubstore Outlet franchise scheme? Please share your information and opinions (anonymous is fine) with a comment below or by emailing ADMIN at UnhappyFranchisee[at]gmail.com. Clubstore Outlet Franchise: What Happened? It appears that 20 franchisee-owned Clubstore Outlet discount retail stores opened since the franchise launched in 2015. Franchisor Tapp Palmer claimed he ran out of money and is not providing the franchise support he owes franchise owners. By our count, 11 franchise stores have closed and the 9 remaining are struggling to survive on their own without the support they paid for. The Clubstore Outlet chain may have blown away without notice if it weren’t for a few brave and outspoken franchise investors such as Bruce & Cindy Schooley of Neenah, Wisconsin who have sued Tapp Palmer and gained media attention. Others have sought to warn others by posting comments on this and other websites. Did Tapp Palmer Have a $275,000 Meal & Travel Spree? How does a small start-up franchisor blow through millions of franchisee money in a short amount of time? How did Tapp Palmer even spend $275,000 on meals and travel in 2006 alone? And who else got a share of the Clubstore pirate’s booty? What Role Did Franserve Franchise Brokers Play in the (Alleged) Clubstore Outlet Scam? ARE YOU FAMILIAR WITH TAPP PALMER, KIM MARINOFF & THE CUBSTORE OUTLET FRANCHISE? PLEASE SHARE YOUR OPINION AND/OR YOUR STORY BELOW. Tapp spent $275,000 in travel in 2016. There would not have even been 8 stores that opened in 2016. How does one spend $35,000 per store on travel expenses? Well living the rock star lifestyle you do. Limos, Ritz Carleton Hotels, Super bowl games, you would think this was the Franchisor MacDonalds Corp with that kind of spend. Also Tapp took a salary of $360,000 in 2016 (according to the FDD “Owners Draw”. When you are starting out on a new business, you don’t take a salary at all. I have been running a Clubstore Outlet for almost 2 years and have not taken out a single penny, as there isn’t any to take, and even if there was, I know you take a modest salary and keep the money in the business to grow. Tapp’s greed got the better of him and he doesn’t care what he has done to others. This guy needs to be in prison in his orange jump suit. Tell your side of the story Tapp…. you always say it is everyone else’s fault, you coward! Dennis Martineau sure is quiet, he had a lot to say about this franchise and how it was a huge hit. I guess when the commissions dried up so did he. I guess it is par for the course, once the franchise consultants can’t sell anymore of this overhyped crap like Clubstore Outlet, they move on to their next victims and don’t do any research into the crap they are selling. Just in it for the money only. Well I sure hope this website brings attention to the corrupt ways that Franchise consultants operate and the overhype this franchisors sell. Franchise brokers are mostly ignorant incompetents. You can become a franchise broker with no experience, pay a fee to a broker network and get 2 days of pretend training on all aspects of franchise sales. Tapp Palmer has even taken money out of the inventory fund. This is not his money to take. There are promissory notes out there for him to pay the money back in full. True to Tapp form he has not made any payment arrangements and is avoiding the people he owes this money too. Lock him up!!! !